Einstein is one of the gray parrots who lives in the Tennessee zoo, though it originally comes from Africa. This amusing parrot is one of the most popular inhabitants at the Zoo in Knoxville, TN, and this year Einstein is celebrating his 30th birthday. Adam Patterson, the head trainer wanted to show how genius this parrot is. He shared a 5-minute comical ‘interview’ with Einstein. Now, the whole world is crazy about the superstar parrot! “Are you famous?” asked Patterson, holding a microphone up to the bird’s beak. “Can you say hi?” the trainer asked. “Hi, sweetheart,” the parrot replied. Einstein is a real genius. She can produce about 200 sounds and understands about 70 words. She even says words without any help, ‘on her tod’. This amazing bird became famous after she won the ‘Pet Star’ title on Animal Planet in 2006. Later on, Einstein also appeared in ‘Ted talk’ with Stephanie White, the trainer who said Einstein is a real ‘chatterbox’. The audience was dazzled by Einstein’s interpretation of a monkey, spaceship and a skunk. The video had at least 2.2 million views. That was not the only surprising thing…Einstein also sang a birthday song to Al Gore. It was on key but still, that was ingenious, don’t you think? 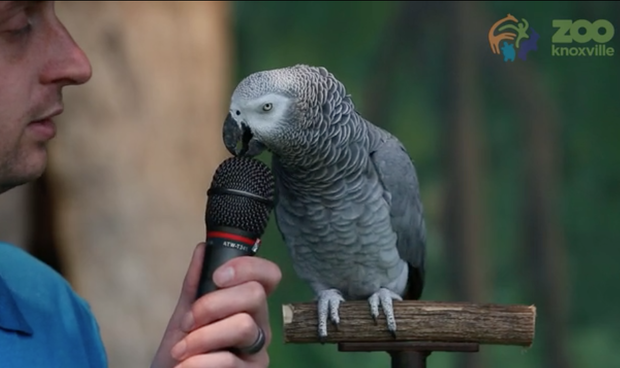 This fabulous parrot constantly surprises with her wide range of talents. Keep talking Einstein! Share this awesome parrot with those you know, hit SHARE below!